We called on some of the top riders we know to find out what they eat when they are preparing for a race or a long ride. What they choose to fuel their efforts may not work for everyone. It’s probably best to experiment with different food choices on an individual basis, and see what works and what doesn’t. 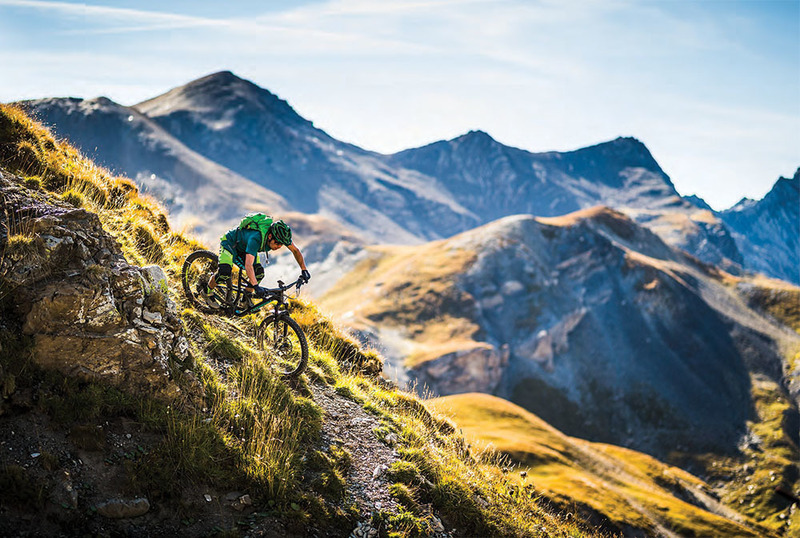 Nevertheless, here are what some of the sport’s top riders told us about the food choices they and others (including Nino Schurter) are using to fuel their efforts. “I love food! Regarding race food in general, I can say that I’m lucky to have Pauline, who follows me to races, cooking good and healthy stuff. “Personally, after feeling bad and having stomach problems, I cut down on gluten, as I have an intolerance. I’m not gluten free, but I avoid it as much as I can and don’t eat gluten the week of a race. “Usually, the night before the race, we eat some rice and chicken curry with some roasted vegetables in the oven (potatoes, sweet potatoes, carrots, leaks, etc.) or something similar, carbs and meat with a good protein ratio. “For breakfast, I don’t change much and go for some scrambled eggs, ham, cheese and avocado with a tea and juice. “The enduro day is long, and you need something that delivers the energy longterm. I found out that sugar peaks early and then you feel hungry. “For lunch, usually we don’t have much time, and we eat some sports bars during the day. So, when I stop at the pits, I go for a quinoa or rice salad with some vegetables—mainly to have a different taste from the sweetness of the bars. “The night before a race I like to have some sort of pasta dish to carbo-load on and make sure I’m hydrating during the day. The morning of it really just depends on how much time I have to eat. Always coffee; that’s a must. If I don’t have much time before I’m on the bike, then I’ll have one or two pieces of toast with some avocado, salt, pepper and olive oil. If I have more time, then I like to have steel-cut oats with some nuts, fruit and maple syrup on top. “Right before my race, I drink Fully Charged by Hammer Nutrition. During my race I’m usually drinking Heed and eating Hammer gels (both by Hammer Nutrition), which get me through the day unless it’s something lasting over four hours. If this is the case, then I’ll try to eat some real food to keep me going, like toast with peanut butter and banana. “I think proper nutrition is key for living a healthy lifestyle and pursuing your goals. By fulfilling our bodies’ needs and providing healthy food, we can live on a higher spectrum. It’s like a race car. If you throw public pump gas in an F1 car, it is not going to drive as fast or smooth as it would if it were filled with top-of-the-line race fuel. We get what we put in is how I see it. “Personally, I do not follow any over-the-top strict diet, but I do prefer to eat healthy across the board. I do most of my own cooking, because I enjoy it, but also to know what is going in my body, which consists of a heavy intake of meat, veggies, fruit, and always staying properly hydrated. I don’t consider myself gluten free or dairy free; however, I rarely consume these products. Finding a diet that works for an individual’s body is key to performing at one’s peak ability. Certain foods that may benefit some might not have the same effect on others, so it is important to find what works for your body. High protein, moderately high fat, and a ton of veggies is the general idea of my diet. “Probably one of the most important aspects of diet while training is eating enough fuel for your body to perform at its peak and also recover to its best ability. A nutritional deficit will negatively affect your body and mind to a point where instead of building and growing, you start to deteriorate. Now that is an extreme word, deteriorate, but it fits the bill well. Same can be said in the opposite direction. If you eat way too much food, your body will store it instead of burn it if it comes to the point where it has too much to digest and use. “I used to eat mountains of pasta the day before the race. Also in the morning I was filling up my stomach with a huge breakfast—bread, muesli, etc. The reason we did it that way in this generation was the racing time was a minimum of 2 1/2 hours. “Nino today eats regular the day before. Some carbs and protein, such as potatoes and chicken. “On race day it’s a light breakfast and, three hours prior, plain white rice. For a 90-minute race, this is plenty. “I like to eat pretty adventurously in general and don’t have any allergies or special diets. I try to follow the “common sense diet” of variety, balance and moderation. That said, I’ve been trying to reduce the amount of meat I’m eating, as I realized I was having some sort of meat nearly every meal. Instead, I’m reaching for more plant proteins and trying to have at least a couple of totally vegetarian days each week. “Pre-race, I typically go with some sort of carbohydrate base such as rice, sweet potatoes or quinoa. Along with that, I’ll have chicken or fish. For longer races, I focus on upping the fat with something like an avocado or two. I typically shy away from bulky vegetables the night before an event. “Morning of, I have eggs and toast almost every time. Honestly, I have the same breakfast almost every morning: three eggs plus toast or a bagel with cream cheese, jelly or butter. Sometimes I’ll get fancy and combine the eggs and bread to make French toast. For longer races, I’ll add an avocado for the toast spread. I’ll also drink a Red Bull before every race. “Post-race, I get a GU recovery drink as soon as possible, then pretty much what-ever I’m craving. Unless it’s a stage race, I usually try to treat myself post race to whatever food I want. Pizza, a big burrito, tons of tacos, a burge—whatever sounds good. MBA: What would you eat for dinner the night before a big race? Julien: I often eat quinoa with white fish or chicken breast. MBA: What would you have for breakfast the morning of your big races? Julien: I eat some eggs with one slice of ham and my homemade gluten-free bread with mashed almonds on it. MBA: Can you share what kind of foods you like to eat the night before a race, the morning of the competition and during a race? Erin: The night before a race I like to eat a meal including lean protein, a minimally processed carbohydrate and some veggies (preferably cooked). Some favorite meals are a chicken stir-fry or curry; or salmon, sweet potatoes, and spinach. The morning before a race I typically have oatmeal with banana, cinnamon, maple syrup, and either protein powder or Greek yogurt. Sometimes, if it’s a longer race and/or if I have more time in the morning I will make pancakes. During a race I rely on GU energy gels. I prefer fruity flavors, and I will do a mix of caffeinated and non-caffeinated gels. After a race I will mix up some GU Recovery drink with almond or coconut milk if I can. Sometimes I travel with the single-serving-sized milk boxes just so I can make a creamier recovery drink, then it definitely tastes like a treat! I will usually follow this up with either some yogurt and granola, fried eggs on toast, or some rice and veggies. For me, nutrition and refueling are just as important midweek after longer training rides. Loading the energy stores with timely food after big rides midweek is just as important as cramming food in the night before, which might be too late. Drinking in warm weather in the days leading up to a race can also be critical to help the body adapt if your body isn’t used to warm conditions. When it comes to the night before, I tend to stick to simple—carbohydrate meals that don’t complicate digestion. Morning of, I often have poached eggs on toast or some kind of cereal/muesli/fruit/yogurt combination with some good coffee three to four hours before racing, depending on the event. I do try to stop sipping water 30 minutes before the start to avoid discomfort and allow my bladder to empty before the gun goes off. If the race is hard, I often crave simple, salty food straight after; chips and guacamole with some coconut water are one of my favorite, quick, go-to snacks before a nicer dinner later. MBA: How much racing do you do these days? Mark: I’m not racing these days, but I’ve been riding more than ever. Just part of the human race these days. MBA: What kind of foods do you normally eat to stay fit? Mark: Organic meats harvested by friends and local ranchers. Lots of homegrown vegetables and fruits. I also like heart when it’s deer season. MBA: Before a hard ride, what do you like to eat? Mark: I start every day with a couple of hen eggs and a fruit smoothie with some ginger and turmeric. It depends on how long I’m riding. If it’s an all-day ride, I’m getting a full-country breakfast. Bacon and eggs, maybe some gravy if I’m motivated. MBA: What would you eat during races? Mark: When I was racing I did not need much at all if the race was under two hours. Maybe a gel, that’s about it. But, I had some interesting combos for some of those all-day rides. One time, on the Santa Cruz Hell Ride, I ate only sardines and dark chocolate. MBA: What do you like to eat after a hard ride or race? Mark: Burgers and/or burritos. I always feel that if I ride or race hard, then I have earned whatever I crave.